Pisa is one of the most important city of art in the world and is is worldwide famous for the Leaning Tower that lies in the Cathedral Square. Besides the Tower, the Cathedral and the Baptistery are worth being visited: marvellous gothic and romanic buildings made of white marble. The Cathedral Square also houses the Museo delle Sinopie, in which the preparatory sketches of the Camposanto frescoes are kept, and the Opera Museum, which hosts a rich collection of sculptures, painting and ancient reliquaries. Pisa is full of many other treasures to be discovered, such as historical buildings, squares, museums and its characteristic Lungarni (walk paths along the river). The particularity of Pisa, which makes it very accessible to tourists, is that the major monuments and the places of interest are situated in the town-centre and easily reachable by foot. Walking along the streets of the centre you will feel that old-times atmosphere, of which the Borgo Stretto Medieval Porch is a perfect example. We suggest a visit to the splendid Piazza dei Cavalieri where you can find Palazzo dei Cavalieri, housing the Scuola Normale Superiore, and Palazzo dell’Orologio. The latter encloses the Muda Tower, where the main character of the XXXIIIrd poem of Dante Alighieri’s Inferno, Count Ugolino della Gherardesca, died. We also suggest you to visit some of the historical buildings facing the Arno River, such as Palazzo Reale, Palazzo Lanfreducci and Palazzo Agostini on Lungarno Pacinotti; Palazzo Gambacorti, Palazzo Mosca and Palazzo Alliata on Lungarno Gambacorti. All these buildings are wonderful examples of late Middle Ages architecture and they contribute to create the typical fairy-tale atmosphere of the Lungarni. Nearby the Solferino Bridge you can find the small church of S. Maria della Spina (1230), which is one of the most important masterpieces of gothic art in Italy. Pisan museums that enclose the beauties of the town are the Palazzo Reale Museum and the San Matteo Museum, whereas the new Palazzo Blu houses several national and international exhibitions of incredible value. The Medieval walls in Pisa are still present and include some preserved arches and doors which are part of the urban furnitures: Porta Garibaldi, Porta Santa Marta, Porta San Zeno, Porta del Parlascio, Porta a Lucca, Porta San Ranierino, Porta Nuova, Porta Buoza, Porta a Mare. Do not miss a contemporary spot in the city: the 180 square metres mural on the south wall of the church of St. Anthony made in 1989 by the famous graffiti artist Keith Haring. Take an open-top bus tour in Pisa on 2 routes designed with stops at the city’s main sights and attractions. Hop off at convenient stops to explore sites at your leisure and re-board when you wish. On-board commentary is available in several languages. On this afternoon excursion from Florence you’ll explore Pisa on a guided tour, admiring its famous leaning tower and numerous other historically significant monuments. On the way you’ll have a chance to enjoy the lush Tuscan countryside. Pisa & Chianti Wine Tour- Half-Day Excursion from Florence! On this full-day, small-group tour of Tuscany you’ll visit Pisa, the Chianti region, San Gimignano, and Siena. Take in the lovely countryside in a comfortable, air-conditioned limousine or mini-van. Taste wine and enjoy lunch at a Chianti farm or castle. On this full day trip in a small group you will visit Siena, Chianti, San Gimignano, Monteriggioni. You will travel in a comfortable, air-conditioned limousine or minivan. Enjoy a traditional tuscan lunch and a wine tasting in a typical winery. Explore the historic cities of Lucca and Pisa on an 8-hour tour from Florence and discover some of the most beautiful Renaissance architecture in Tuscany. Marvel at the sights of Pisa’s Piazza dei Miracoli, such as the Leaning Tower, Duomo, and more. Explore the famous sights in Pisa and Lucca on this 8-hour guided excursion from Florence. Head to Pisa in the morning before visiting Lucca in the afternoon and enjoying a Buccellato tasting at a local pastry shop. Enjoy a fascinating excursion to some of the great artistic cities of Tuscany. Explore the historic walled city of Lucca, see the famous sights of Pisa and discover the coast of the Versilia Sea in just one day. Enjoy a splendid excursion through the picturesque Tuscan countryside to the historic university city of Pisa. Take in this charming town, famous all over the world for its iconic Leaning Tower. Experience renaissance Italy at its finest all in one day with your your own driver. Explore the ancient sites of Pisa and Florence including the Leaning Tower and main square in Pisa and the Duomo, Ponte Vecchio, and the Uffizi gallery in Florence. Pisa plays a key role in Italy's renaissance history. It was here that new architecture, sculpture and painting anticipated the florentine movement of the renaissance. Visit this impressive town during an unforgettable private half-day tour. Enjoy a full-day private tour of historic Pisa and the world-famous Leaning Tower, majestic Lucca still encased in its ancient city walls, and Viareggio, a coastal town famous for its beautiful beaches and delicious Italian cuisine. Explore Pisa and Lucca, the heart of the beautiful region of Tuscany. During a private guided walking tour in Pisa observe important monuments including the Leaning Tower. Admire Lucca's 16th century walls and traditional antique dealers street. Spend a day in the medieval splendor of Pisa on this memorable half-day tour from Florence. Enjoy the lavish architecture and art surrounding Piazza dei Miracoli. Don't forget to visit the destination-packed city of Pisa on your trip to Tuscany. Admire the Piazza dei Miracoli, the Pisa Cathedral, and the Monumental Cemetery. Learn about Leaning Tower on this fascinating tour! Come discover Lucca and Pisa, unmissable destinations for those truly wishing to experience the culture and charm of Tuscany. Let yourself relax on this guided tour of both cities, complete with a Buccellato tasting, a typical Lucchese cake! Enjoy a day at the Leaning Tower of Pisa, exploring its surrounding square and church. Your guide will give you fun facts and share some of the tower's secrets before you skip the line and ascend the Leaning Tower itself! Spend a day in Pisa to uncover its mysteries and magic. Visit the Duomo and Cathedrals before heading to the Leaning Tower itself, for a climb and history lesson on this fascinating building. Embark on an exclusive tour of Pisa and Florence. Check out Italy's fabulous Renaissance art, monumental architecture, Tuscan squares, and historical cathedrals. See the Leaning Tower of Pisa, the Sepulcher of Michaelangelo, and much more. Depart from Rome and explore the heart of the Renaissance on this 3-day tour of Florence. Discover the many artistic and architectural treasures of Florence with your expert guide, and enjoy a day-trip to Pisa - home of the Leaning Tower. Enjoy a visit to Piazza del Duomo and the Leaning Tower of Pisa with an expert guide on this 3-hour walking tour. Enter a fascinating cathedral from the 11th-century, then take a walk to the city center to discover the hidden treasures of Pisa. Immerse yourself in the magnificent monuments of Pisa’s Piazza dei Miracoli, dominated by the legendary Leaning Tower. Climb the tower to the top of the 294 steps for panoramic views of this medieval jewel of a city. Do not miss this exciting walking tour through the beautiful and historic city of Pisa. Discover the impressive Piazza dei Miracoli, and end the tour with a climb up the famous Leaning Tower for a beautiful panoramic view of the city. See the exquisite architecture of the Middle Ages in Pisa's central squares, visit the largest baptistery in Italy, the Leaning Tower, and Pisa University, as your guide takes you on an informative walk through the historic streets of Pisa. Explore the historic churches, palaces, and bridges of Pisa on a 2-hour guided Segway tour. See the Leaning Tower, Church of St. Maria della Spina, Piazza Carrara, Via della Faggiola, and more. Be seduced by the flavors and sights of Tuscany on a full-day tour of Siena, San Gimignano and Pisa. Sample classic wines of the Chianti and Vernaccia, and taste tantalising produce from the rolling hills of the beautiful farmlands. Transfer from your accomodation in Florence by Mercedes Class E or Minivan, all air conditioned and offering all comforts. We could arrange also the reverse path, please specify. Explore the characteristic villages of Cinqueterre National Park and see the spectacular coastline of the Ligurian Riviera. Visit Riomaggiore and Manarola, and stop to sample local wines and produce. Transfer from your accommodation in Siena to Pisa International Airport, or vice versa, with a private 2-hour ride. Sit back, relax, and enjoy the scenery as you are transported to your destination in comfort. Set out on a treasure hunt in Tuscany, an area known not only for wine but also for truffles. On a full-day trip from Florence take the chance to hunt down truffles with the aid of a truffle dog. Then enjoy wine tasting and a lovely Tuscan lunch. Enjoy a private day shore excursion from the port of Livorno to visit the Florence and Pisa. Climb up the Leaning Tower of Pisa, and explore the main sights in Florence on a guided tour. You may also personalize your tour to visit what interests you most. Explore the best of Tuscany on a sightseeing tour of Pisa, San Gimignano, Monteriggioni, and the Chianti wine region. Taste some of Italy’s best-known wines, discover Etruscan hillside towns, and stand in one of the world’s most miraculous public squares. Discover the cradle of the Renaissance on a full-day shore excursion to Florence and Pisa from the cruise ship port of Livorno. Go to the Piazza dei Miracoli and see the Leaning Tower of Pisa, and tour the historic center of Florence. Take the stress out of the start of your Tuscany vacation and pre-book an airport transfer from Perugia’s San Egidio Airport to locations in Florence, Pisa, Grosseto, Arezzo, and Siena. Relax in private sedans or 8-seater vans, depending on your needs. Discover the Cradle of the Renaissance on a full-day sightseeing tour of Pisa and Florence from Rome. Get spectacular views of the Duomo in Florence from Piazzale Michelangelo, see Pisa’s Piazza dei Miracoli, and more. Enjoy a Pisa airport transfer in a luxury vehicle with plenty of room for your luggage. Whether you’re visiting the area on holiday or business, you’ll experience reliable and friendly service. Transfers both from and to the airport are available. Travel in comfort from Pisa City to Umbria in a new luxury car or van, on this pre-booked service. Perfect for holidaymakers or business travelers, the 1-way transfer is available in either direction, and includes door-to-door service. Explore Pisa and Florence on a private 9-hour shore excursion from Livorno and immerse yourself in the art and architecture of the Cradle of the Renaissance. See the Piazza dei Miracoli, Leaning Tower of Pisa, Santa Croce Church, and more. Travel from Pisa to Umbria in style in a luxury vehicle complete with a professional chauffeur. Make a 2-hour stop along the way at a luxury mall idyllically nestled in the beautiful Tuscan countryside to stretch your legs and do some shopping. Travel to Florence, the birthplace of the Renaissance, and to Pisa to see its iconic leaning tower and Byzantine cathedral on a full-day shore excursion from Livorno. Visit centuries-old churches, piazzas, and museums in these important Tuscan cities. Visit the Carrara Marble Mountains and find out about the marble extraction process on a private, full-day tour. Ride in a 4x4 Land Rover, visit 30 quarries, admire the nature in the La Spezia province, enjoy lunch in Colonnata, and visit Pisa and Lucca. Book an exclusive private transfer from Pisa Airport to La Spezia: enjoy the fastest and most comfortable way to reach the charming villages of Le Cinque Terre and trust a professional and reliable driver during your trip! Experience the best of north-central Italy on a 9-day small group tour of Ravenna, Assisi, and the Italian Lakes. Cross the Veneto to the city of Venice, marvel at the Renaissance art of Florence, Pisa and Siena, see the imperial sites of Rome, and more. Travel back to the days of the Italian Renaissance on a 9-hour private tour of Pisa and Florence from La Spezia Port. See some of the most impressive buildings from one of Italy’s most fertile periods for architecture, including the Leaning Tower. Travel back to the days of the Italian Renaissance on a 9-hour private tour of Pisa and Florence from Livorno. See some of the most impressive buildings from one of Italy’s most fertile periods for architecture, including the Leaning Tower of Pisa. 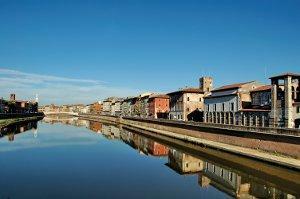 Spend an afternoon enjoying the medieval splendor of Pisa on this guided tour from Florence. You’ll travel by comfortable air-conditioned coach, explore the lavish architecture and art surrounding the Piazza dei Miracoli, and have some free time to shop. Explore the marble quarries of Carrara by off road vehicle on a full-day tour from Florence, Siena, Montecatini or S. Gimignano. Experience the unique flavor of "Lardo di Colonnata," enjoy some free time in Pisa’s Piazza dei Miracoli, and more. See the best of Tuscany as you visit historic Pisa, San Gimignano, and Siena. Enjoy a day experiencing breathtaking landscapes, famous cities, and medieval villages, and tasting wines and other local products. Lunch and dinner are included. Take the worry out of the start or end of your vacation in Florence, and pre-book a shared transfer from Pisa Airport to accommodations in Florence city center. Save time and money on unreliable taxis, or the hassle of navigating public transport. Discover the beauty of Tuscany and visit its medieval cities and towns on a guided excursion from Florence. You’ll explore the World Heritage Site of San Gimignano, Pisa, and Siena. Enjoy local foods and wines at lunch. Explore the picturesque villages of Cinque Terre on the Italian Riviera on a 10-hour sightseeing tour from Pisa or Lucca. Sail the Ligurian Sea from Riomaggiore to Manarola, or travel by train to the cliffside villages of the Cinque Terre National Park. Explore the natural beauty of Lucca and the Garfagnana Hills on a scenic 9-hour tour from Pisa. Enjoy a delicious meal of typical Tuscan produce, and travel back in time on a tour of one of the region’s medieval castles. See the Devil’s Bridge, and more. Visit Pisa and Lucca as well as a small town in Chianti on this private shore excursion from La Spezia. See the Piazza dei Miracoli and the Leaning Tower in Pisa, the defensive walls and botanical gardens of Lucca, and enjoy wine tasting in Montecarlo. Marvel at the Renaissance architecture of Pisa’s “Square of Miracles” on a 5-hour wine tasting tour from Florence. Explore the vineyards of the Chianti winelands, and stop at a local winery to sample Tuscan produce and celebrated Chianti wines. Explore Florence and Pisa on a guided shore excursion. Marvel at Florence's stunning Renaissance monuments, including Santa Maria del Fiore, Brunelleschi’s Dome, and Piazza della Signoria. Stop in Pisa to see the iconic Leaning Tower and the Baptistery. On this tour that takes you to the heart of Tuscany, you’ll drive past rolling hills, vineyards, and olive groves. Discover the charms of the ancient Etruscan town of Volterra, and visit Andrea Bocelli’s Theater of Silence, an open-air amphitheater. Take to the scenic Tuscan roads and visit the centuries-old cities of Siena and San Gimignano on a day-long tour. Enjoy breathtaking panoramas, stunning architecture, and a wine tasting session in the countryside. Explore Florence, one of Italy's most beautiful cities, on a day-long minivan tour that begins in either Lucca or Pisa. Marvel at the city's architecture and picture-perfect area landscapes. Enjoy a visit to the Uffizi Gallery (optional). Explore the rolling hills of Tuscany on a 5-hour wine tasting tour in the Chianti area from Pisa or Lucca. Visit 2 wineries to learn about the winemaking process, and taste red and white regional wines. Walk among the vines and try some local olive oil. Visit Pisa and Lucca, among the most important historical towns in Tuscany, on a tour that begins in either Florence or Siena. Admire the charming Tuscan landscapes as you’re immersed in the history, traditions, and sights of these popular destinations. Take the worry out of your transportation needs between Florence and Pisa, and transfer in style with a private transfer service. Admire the scenery as you travel by air-conditioned vehicle. Enjoy the services of an English-speaking driver. Skip the long lines at the world-famous Leaning Tower of Pisa and the Pisa Cathedral's ticket office. Climb up the tower at your own pace and enter the fascinating 11th century cathedral. Explore 2 beautiful cities of the Renaissance on a 9-hour tour from Florence to Lucca and Pisa. Marvel at Romanesque and Gothic architecture. Look inside Pisa Cathedral on Piazza dei Miracoli, discover the city walls of Lucca, and much more. Discover the picturesque villages of Cinque Terre, and explore a beautiful stretch of the Mediterranean coast on a private 10-hour tour from Livorno, Lucca, or Pisa. Marvel at the brightly painted houses, and take a train or boat ride along the coast. A beautiful wine experience in a Tuscan farm around the hills of Vinci. From the vineyard to your glass! Discover the former home of Leonardo da Vinci, and sample the wines of the Chianti wine lands on an 8-hour tour from Florence. Travel across the hills of Tuscany, and visit the Vinci Museum to see a collection of Da Vinci’s groundbreaking inventions. This is the best experience for those who want combine good Chianti wine with relaxing. This Tuscan Cooking class offers an authentic experience of real Italian food and the Tuscan way of life. Explore the marble quarries of Carrara on a 4x4 off road vehicle with this full-day tour. Experience the unique flavor of ‘Lardo di Colonnata’, enjoy some free time in Pisa’s Piazza dei Miracoli, and more.